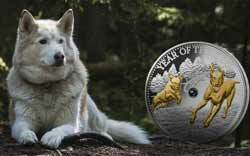 Most of the major mints have a silver coin format that could almost be described as a baseline signature. 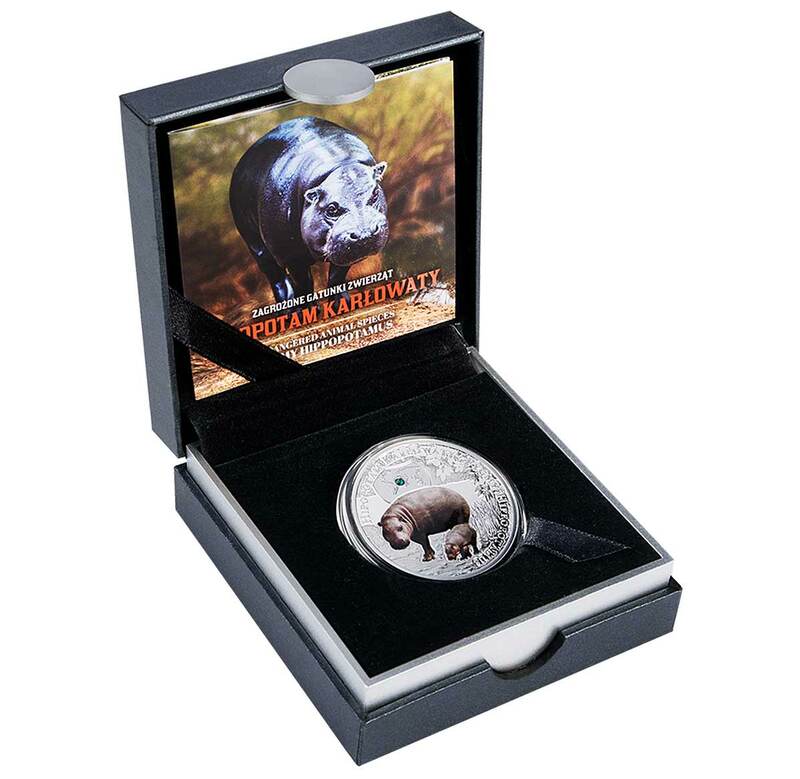 The Perth Mint has its coloured 40.6mm/31.1g format, the Royal Mint its 38.6mm/28.28g sterling silver, and the Mint of Poland, issuer of this series, a 38.6mm/17.5g coloured format. 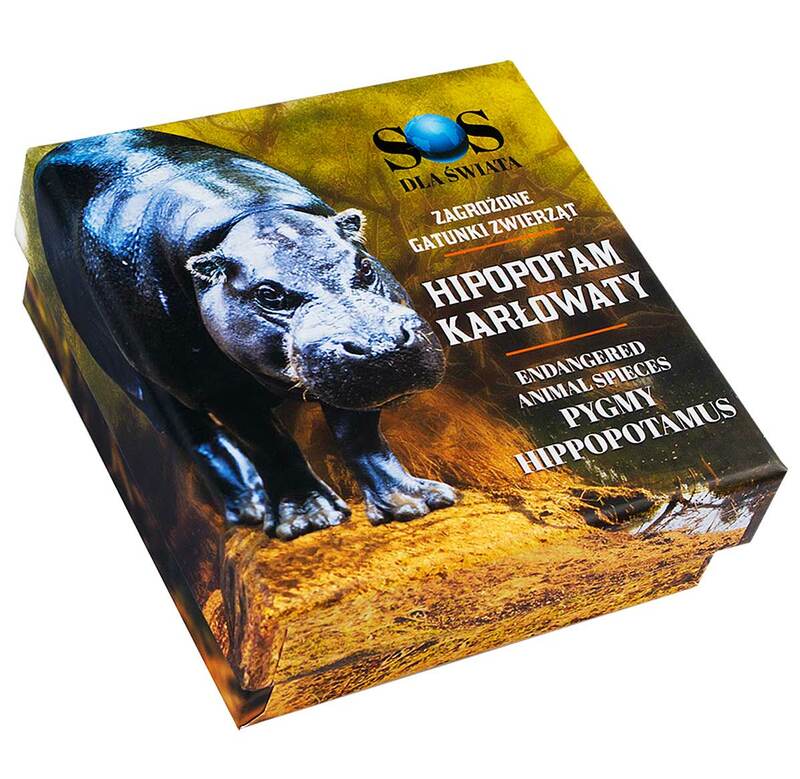 This latest range to wrap up from the Mint of Poland is one such. Called S.O.S. 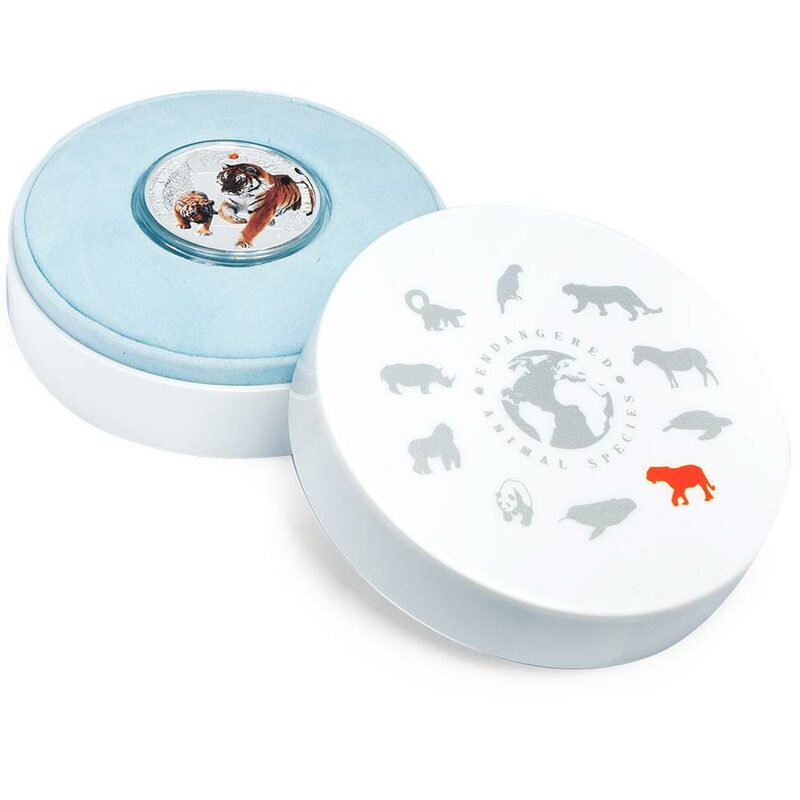 Endangered Animal Species, the range consists of ten coins in total, each depicting one of the myriad number of animals that are in danger of disappearing largely due to the actions of mankind. 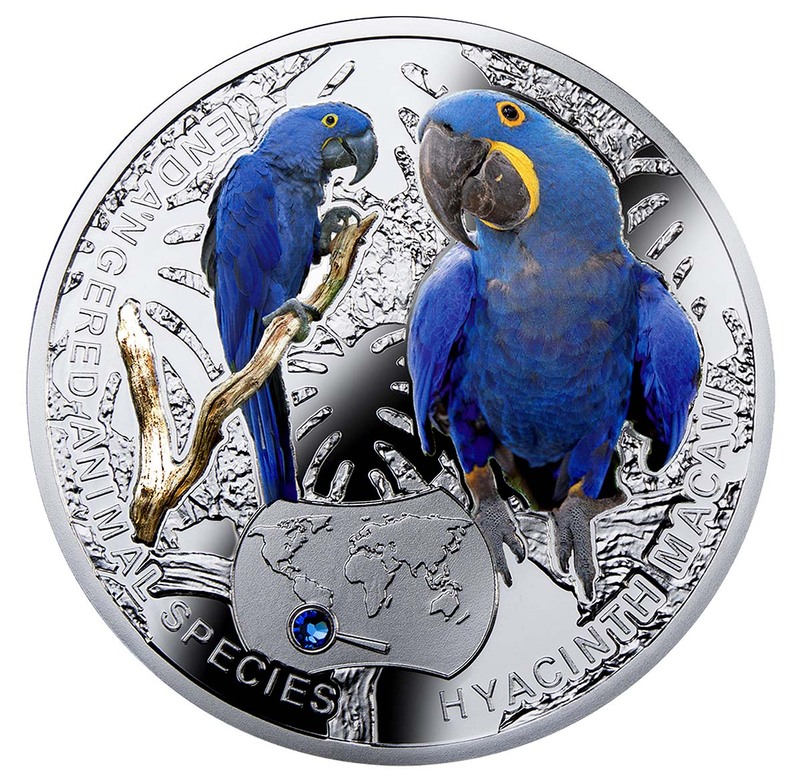 The first coin debuted back in December 2013 with the Hyacinth Macaw on the reverse side, and the tenth coin launched in February 2015 adorned with the Blue Whale. Each of the ten coins carries a coloured depiction of the subject animal set in a clean struck background. 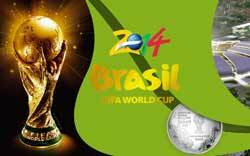 Also struck into the reverse face is a small curve-walled rectangle containing a map of the world. 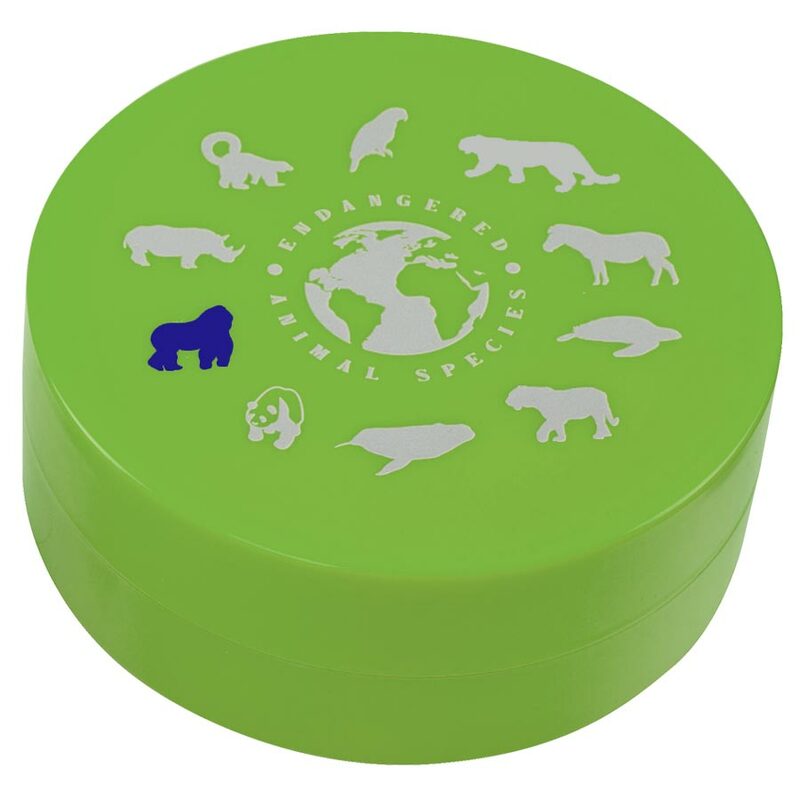 Inside this is a small representation of a magnifying glass placed over the region the subject animal originates from, inset into which is a coloured Swarovski crystal, we believe from their Elements range. These inset crystals can be quite disruptive to a good design and they only work when applied in moderation and with care. That’s certainly the case here and most will agree that the crystal doesn’t detract from the overall design at all. 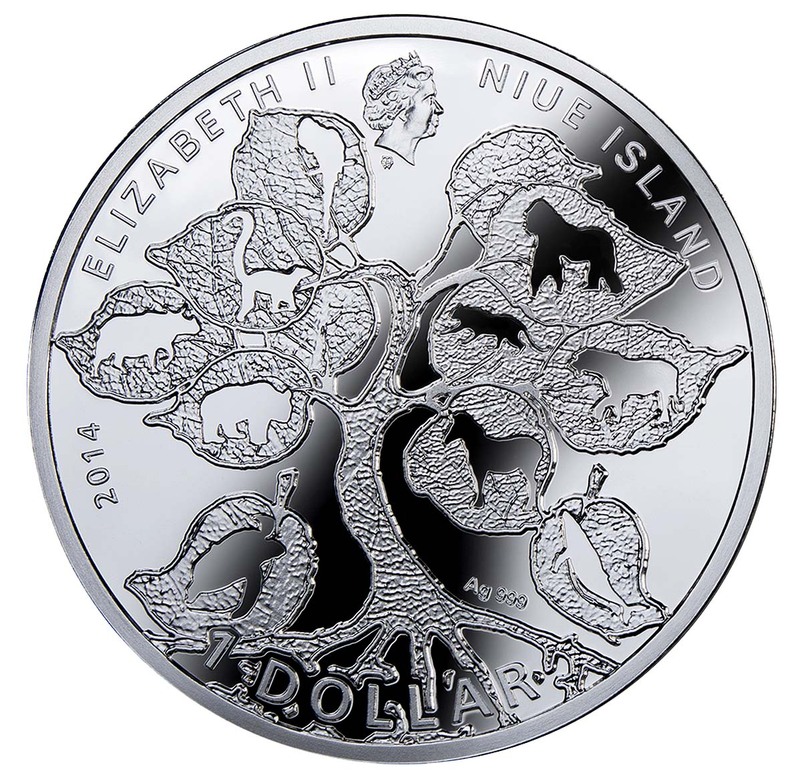 The obverse of the first coin featured a tree of life similar to that in Norse mythology, containing small silhouettes of the ten animals to appear in the series. The Queen’s effigy, compulsory on Niue issued coins, was miniaturised and placed at the top. It was a great design, but lasted just one coin before being replaced by the standard full-sized effigy. We’re not sure why and haven’t been given an answer to questions about it, but it’s likely the size of the Queens effigy may have been a bit small for someone high up. How the design passed the strict approval process in the first place will remain a mystery, but the series lost a little character when the original obverse was replaced. 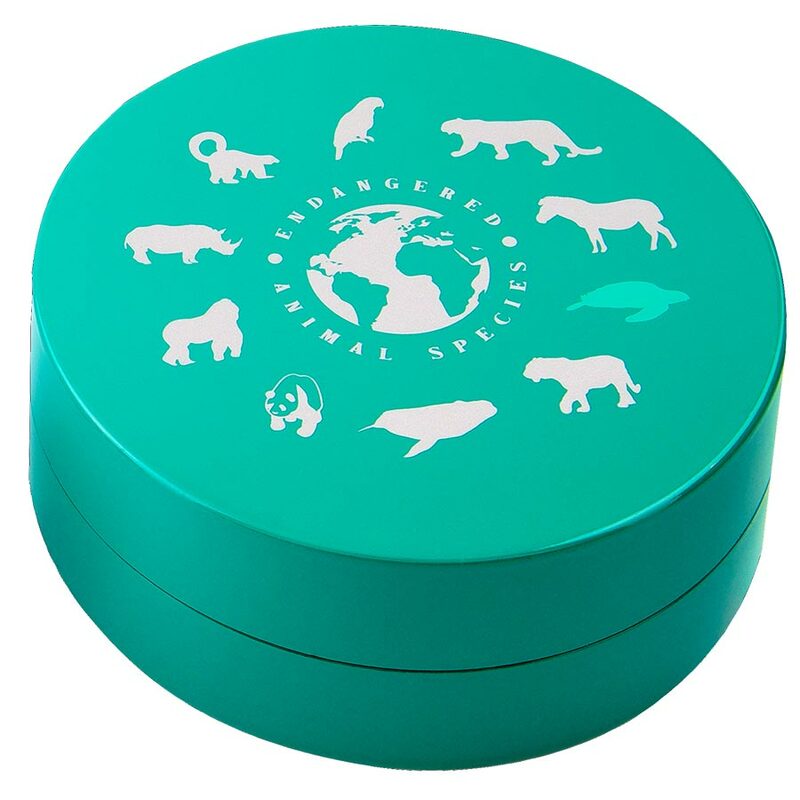 Each coin comes beautifully packaged in a colourful shipper enclosing a quality cylindrical box. These are individually coloured, some a little too gaudily for my taste, but they do look the part overall and we’ve added images of each for your perusal. There is a collectors box that holds all ten coins on two levels, but good luck tracking one down. 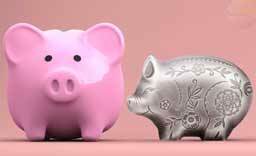 Available at many coin dealers worldwide, the Royal Canadian Mint is also now offering them on a subscription basis, although as all the coins are readily available, we’re not quite sure why you’d have to wait until October for the first release. We’re fans of these coins. Unpretentious, interesting, and hanging together well as a series, they’re as equally suited to giving a single coin as a gift, as they are to a collector building a set. It might look a little like Monty Pythons iconic Norwegian Blue, but fortunately, the Hyacinth Macaw isn’t yet deceased as a species. It’s a long way from being good news though. There are under 5,000 birds still inhabiting the rainforests of central and eastern South America, mainly due to the usual appalling reasons like the pet trade, deforestation and other commercial activities. Parrots in general are one of the most vulnerable bird species on Earth, but there are many efforts ongoing to protect them and the prognosis is decent. The Hyacinth Macaw is the longest parrot alive, coming in at a metre (39″) with a winspan of around 1.3m (4ft). It’s also been known to use tools, an amazing thing to watch. 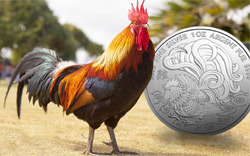 It’s fitting that a beautiful bird like this has a pretty coin to match and this latest 1/2oz silver coin from Niue is certainly that. 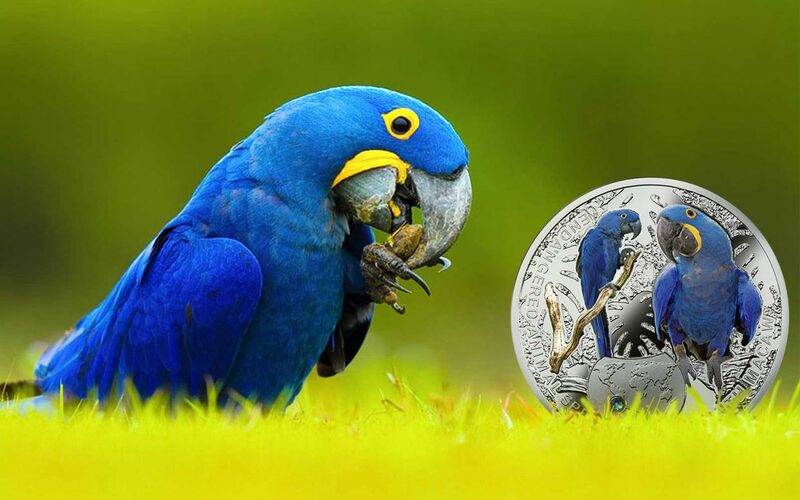 REVERSE: In the central part of the coin – two multi-coloured images of the Hyacinth Macaw. Below – an image of a map, showing the location of occurrence of the bird. 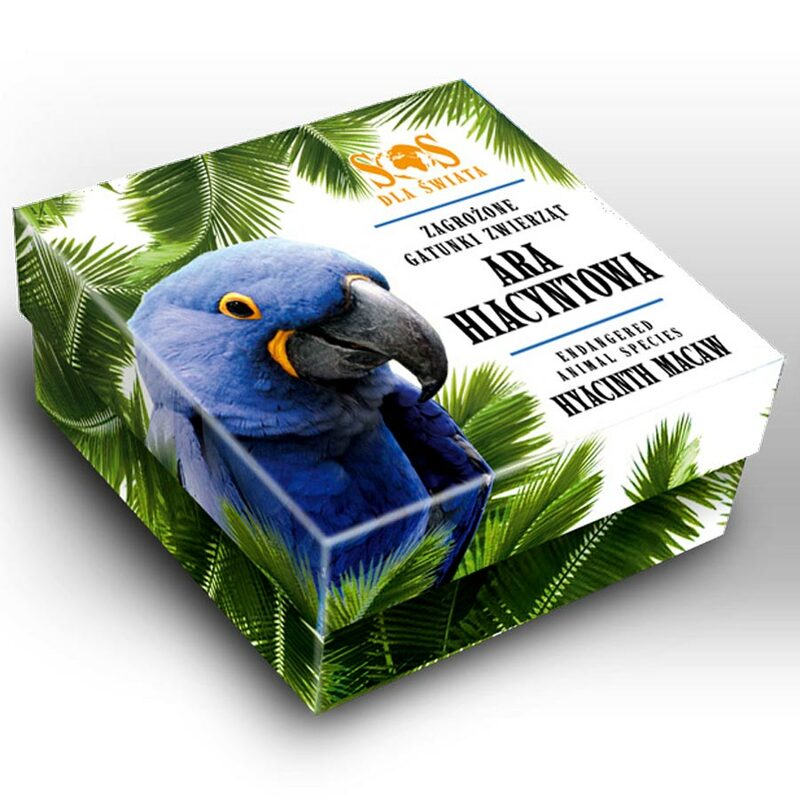 Along the rim – inscriptions: ENDANGERED ANIMAL SPECIES (the name of the series), HYACINTH MACAW (the name of the coin). Undoubtedly one of the most magnificent animals that walks the face of the planet today, the Siberian, or Amur Tiger is one of the largest cats to have ever lived, with males having been recorded near 3.5m long and weighing well over 300kg. While any sane person would point to the Tiger as being at the top of the food chain, as usual, mankind screws that up as well. By the 1940s, hunting had driven the Amur tiger to the brink of extinction, with no more than 40 individuals remaining in the wild. The subspecies was saved by Russia becoming the first country in the world to grant the tiger full protection – and also by the Cold War, which saw the tiger’s forest home completely closed off to most people. By the 1980s, the population had increased to around 500. Despite an increase in poaching following the collapse of the Soviet empire, continued conservation and antipoaching efforts by many partners, including WWF, have helped keep the population relatively stable at around 450 individuals. 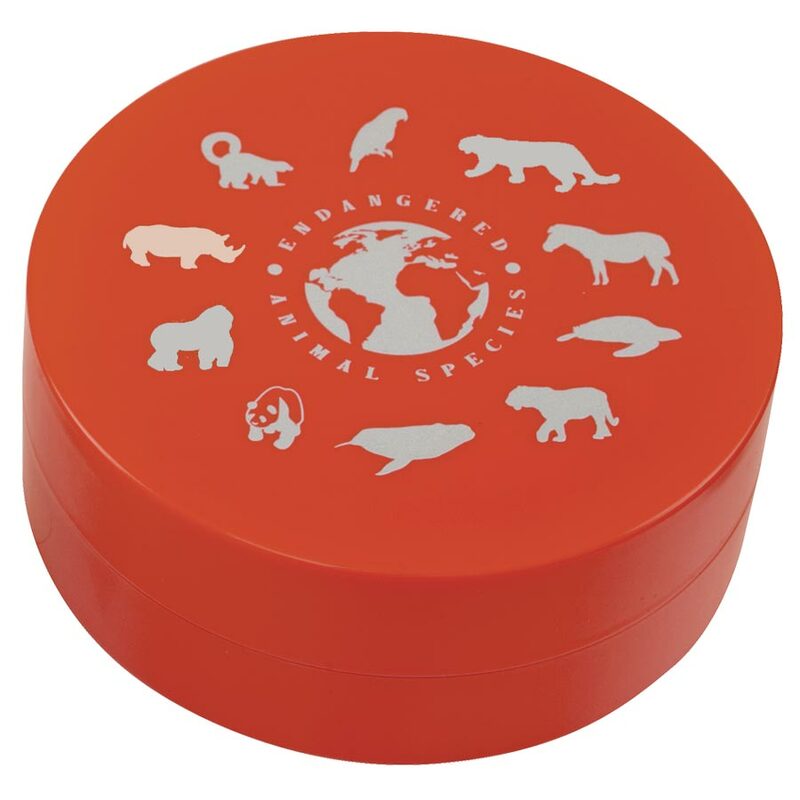 WWF was one of the organizations to support the 2005 Winter Survey of Amur Tigers, which found between 334–417 adults and 97–112 cubs. This population is the largest unfragmented tiger population in the world. 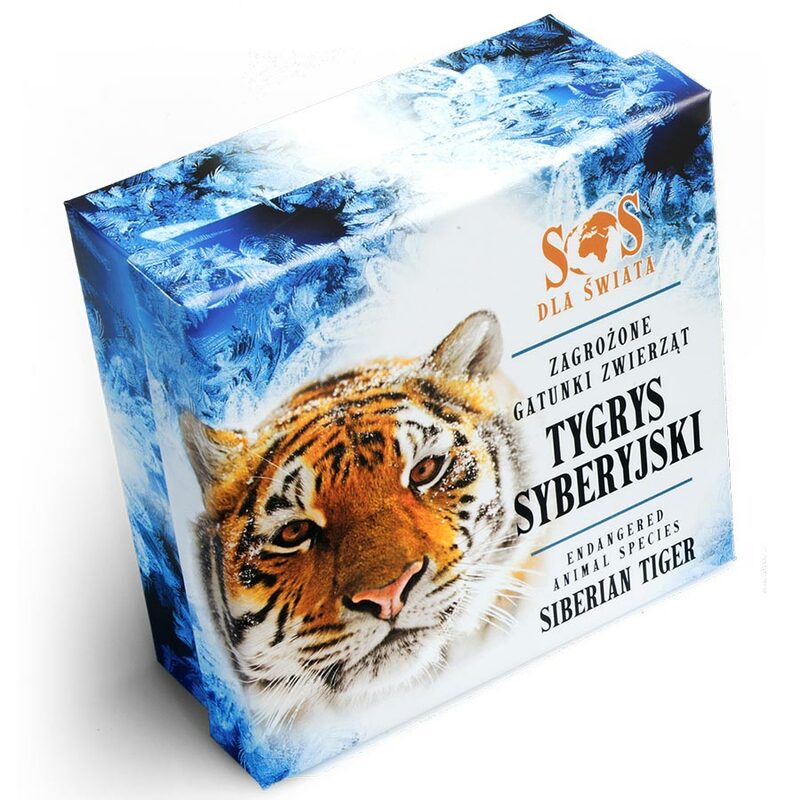 The most immediate threat to the survival of Siberian tigers is poaching to supply demand for tiger parts for use in Traditional Chinese Medicine, a ‘medicine’ responsible for damage to myriad creatures with it’s fantastical and unproven claims. It would be a crime of epic proportions if these animals were to join the three of the eight subspecies of Tiger that existed 100 years ago, in extinction. 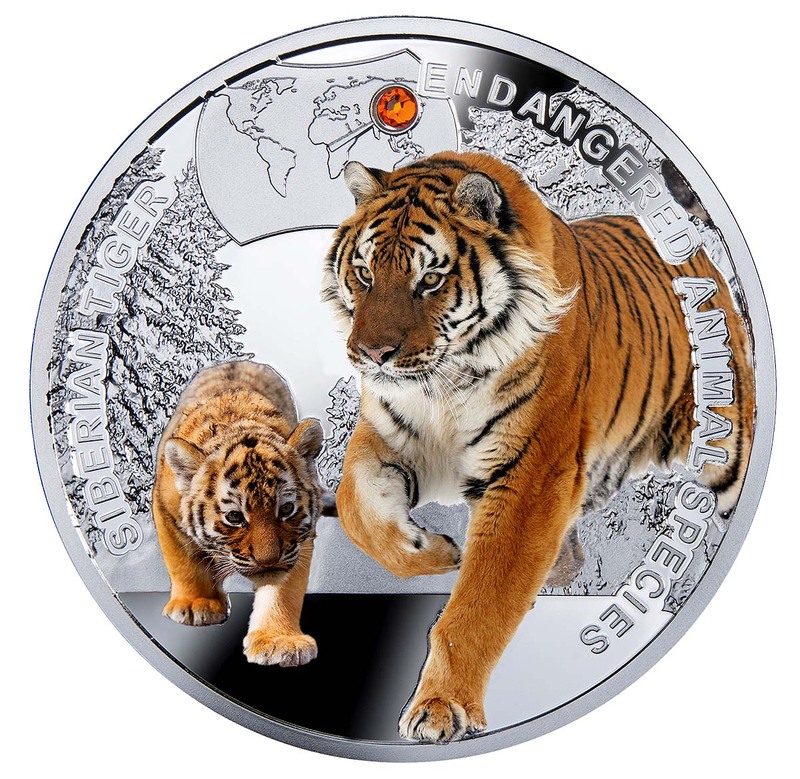 REVERSE: In the central part of the coin – two multi-coloured images of the Siberian tiger. Above – an image of a map, showing the location of occurrence of the tiger. 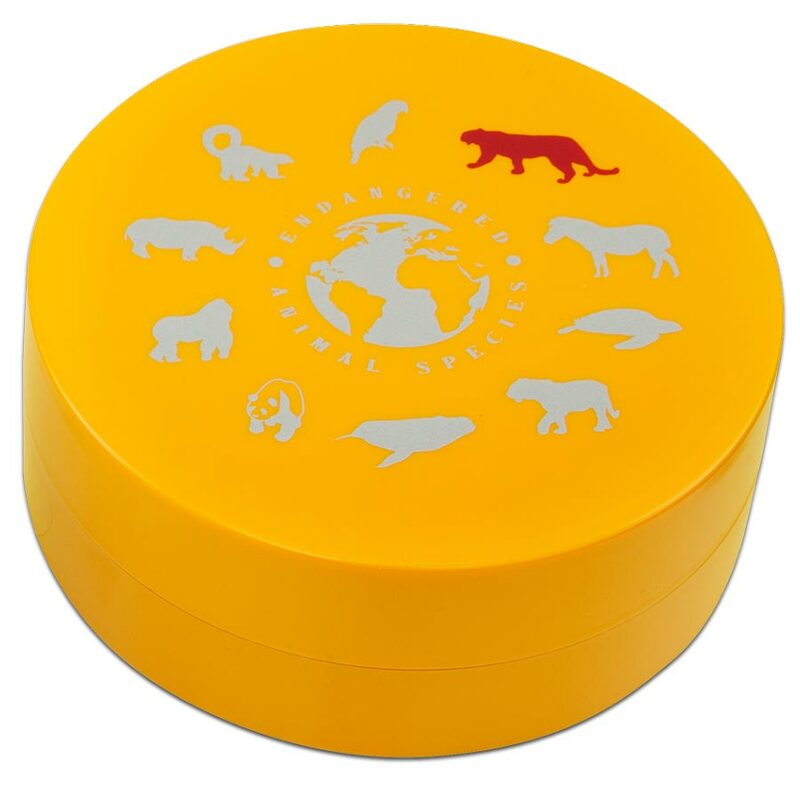 Along the rim – inscriptions: ENDANGERED ANIMAL SPECIES (the name of the series), SIBERIAN TIGER (the name of the coin). The Grévy’s zebra (Equus grevyi), also known as the imperial zebra, is the largest extant wild equid and the largest and most endangered of the three species of zebra, the other two being the Plains Zebra and the Mountain Zebra. Named after Jules Grévy, it is the sole extant member of the subgenus Dolichohippus. The Grévy’s zebra is found in Kenya and Ethiopia. Compared with other zebras, it is tall, has large ears, and its stripes are narrower. The Grévy’s zebra lives in semi-arid grasslands where it feeds on grasses, legumes, and browse; it can survive up to five days without water. It differs from the other zebra species in that it does not live in harems and has few long-lasting social bonds. Male territoriality and mother–foal relationships form the basis of the social system of the Grévy’s zebra. This zebra is considered to be endangered. Its population has declined from 15,000 to 3,000 since the 1970s. However, as of 2008 the population is stable. 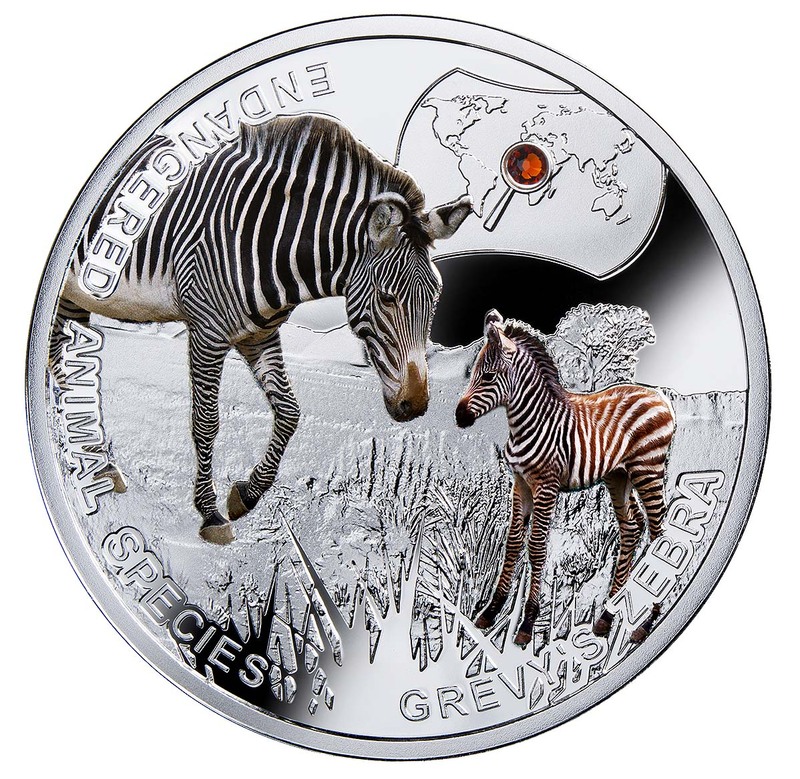 REVERSE: In the central part of the coin – two multi-coloured images of the Grevy’s zebra in the bosom of nature. Above – an image of a map, showing the location of occurrence of the zebra. 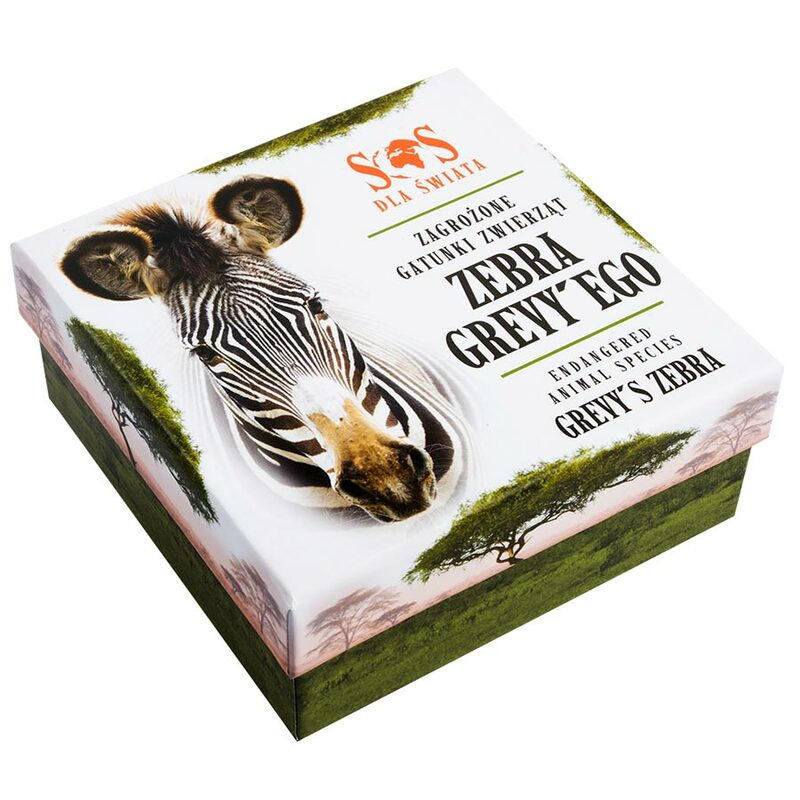 Along the rim – inscriptions: ENDANGERED ANIMAL SPECIES (the name of the series), GREVY’S ZEBRA (the name of the coin). The Panda (Ailuropoda melanoleuca, literally “black and white cat-foot”), also known as the Giant panda to distinguish it from the unrelated Red panda, is a bear native to south central China. It is easily recognized by the large, distinctive black patches around its eyes, over the ears, and across its round body. Though it belongs to the order Carnivora, the panda’s diet is over 99% bamboo. Pandas in the wild will occasionally eat other grasses, wild tubers, or even meat in the form of birds, rodents or carrion. In captivity, they may receive honey, eggs, fish, yams, shrub leaves, oranges, or bananas along with specially prepared food. The panda is a conservation reliant endangered species. A 2007 report shows 239 pandas living in captivity inside China and another 27 outside the country. Wild population estimates vary; one estimate shows that there are about 1,590 individuals living in the wild, while a 2006 study via DNA analysis estimated that this figure could be as high as 2,000 to 3,000. 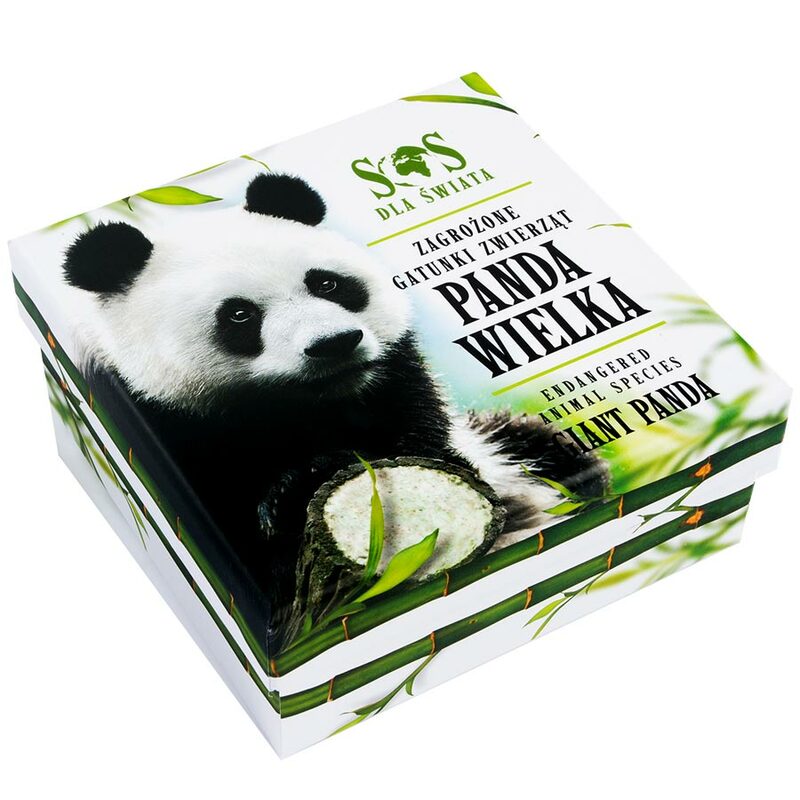 Some reports also show that the number of pandas in the wild is on the rise, however, the IUCN does not believe there is enough certainty yet to reclassify the species from Endangered to Vulnerable. 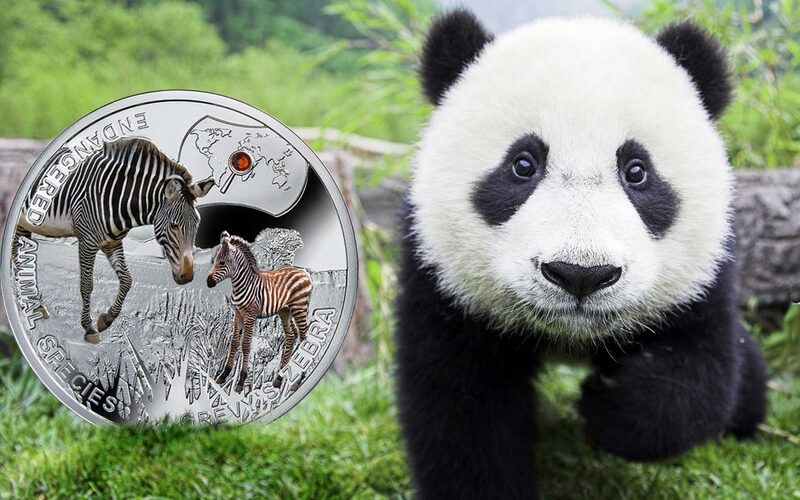 REVERSE: In the central part of the coin – two multi-coloured images of the giant panda. Above – an image of a map, showing the location of occurrence of the panda. 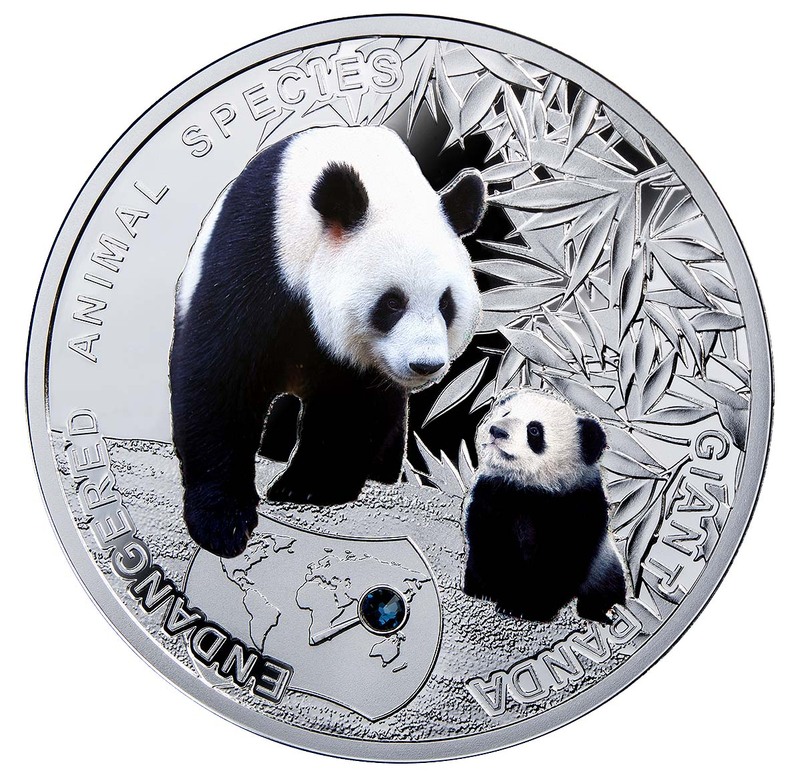 Along the rim – inscriptions: ENDANGERED ANIMAL SPECIES (the name of the series), GIANT PANDA (the name of the coin). For most of the 20th century the continental black rhino was the most numerous of all rhino species. Around 1900 there were probably several hundred thousand living in Africa. During the latter half of the 20th century their numbers were severely reduced from an estimated 70,000 in the late 1960s to only 10-15,000 in 1981. In the early 1990s the number dipped below 2,500, and in 2004 it was reported that only 2,410 black rhinos remained. 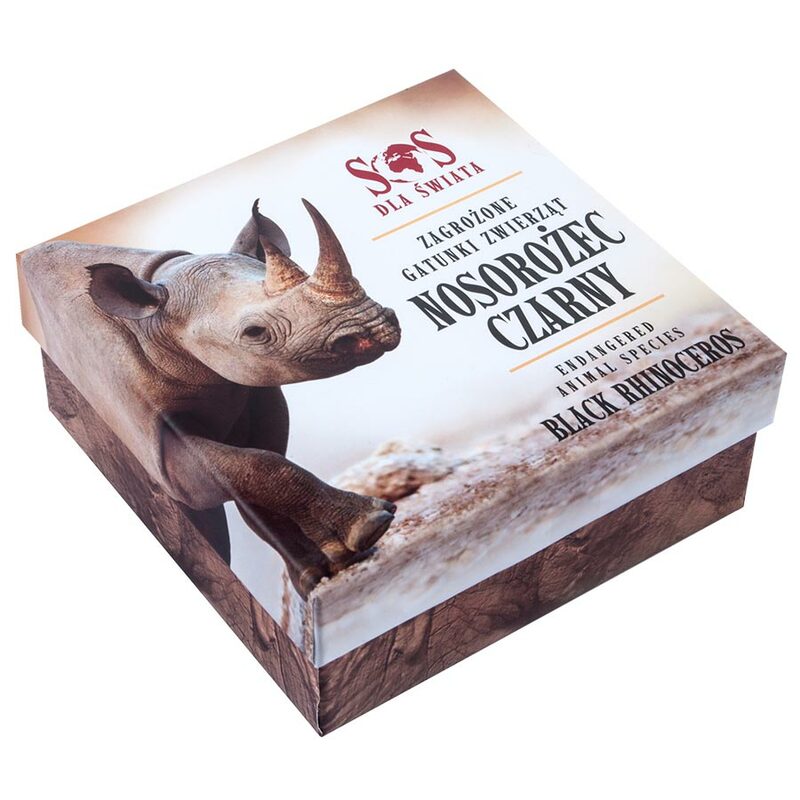 According to the International Rhino Foundation which breeds black rhinos, the total African population had recovered to 4,240 by 2008 (which suggests that the 2004 number was low). In 1992, nine rhinoceros were brought from Chete National Park, Zimbabwe to Australia via Cocos Island. After the natural deaths of the males in the group, 4 males were brought in from USA and have since adapted well to captivity and new climate. In 2002 only 10 West African rhinos remained in Cameroon, and in 2006 intensive surveys across its putative range failed to locate any, leading to fears that this subspecies was extinct. In 2011 the IUCN declared the Western black rhino extinct. REVERSE: On the reverse there are depicted two multi-coloured images of the baby and adult rhinoceros in the bosom of nature. Below – an image of a map, showing the location of occurrence of the rhinoceros. Against a map – a magnifier embedded with a SWAROVSKI ELEMENTS crystal, which imitates lens. 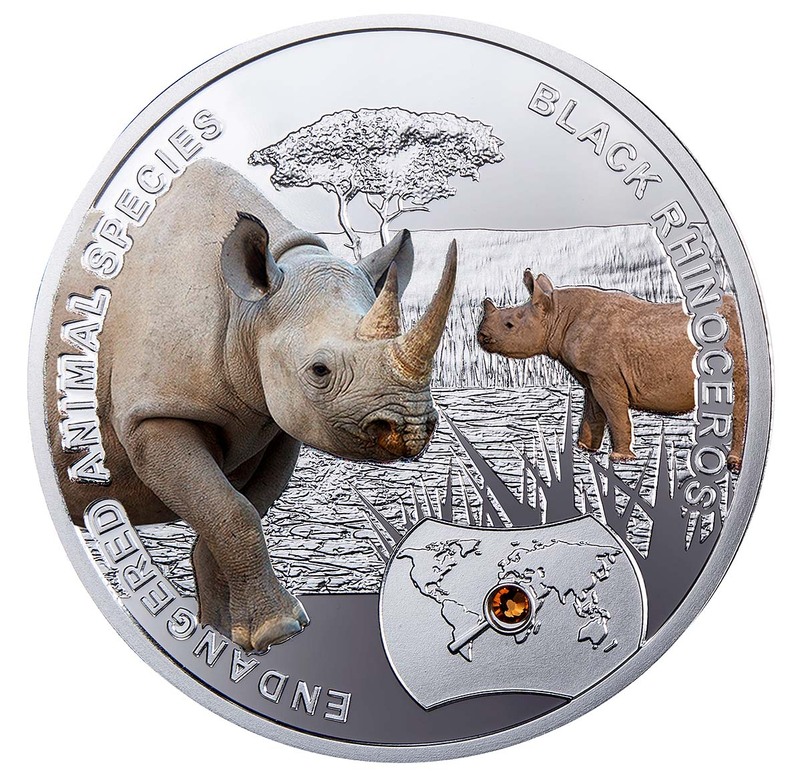 Along the rim – inscriptions: ENDANGERED ANIMAL SPECIES (the name of the series), BLACK RHINOCEROS (the name of the coin). The mountain gorilla (Gorilla beringei beringei) is one of the two subspecies of the eastern gorilla and exists in two populations. One is found in the Virunga volcanic mountains of Central Africa, within three National Parks: Mgahinga, in south-west Uganda; Volcanoes, in north-west Rwanda; and Virunga in the eastern Democratic Republic of Congo (DRC). The other is found in Uganda’s Bwindi Impenetrable National Park. 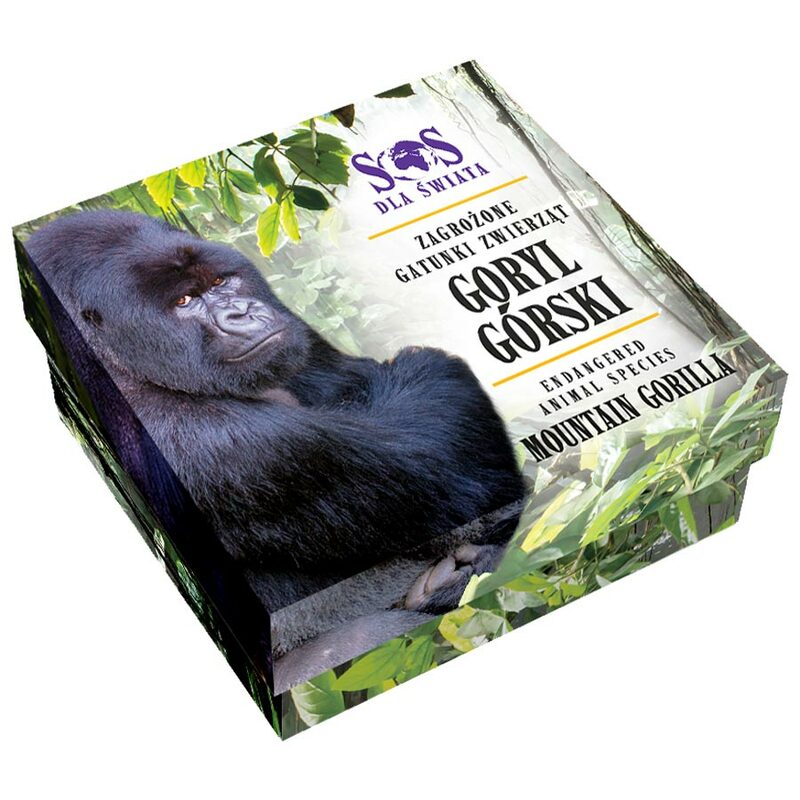 The mountain gorilla is primarily a herbivore; the majority of its diet is composed of the leaves, shoots and stems (85%) of 142 plant species. It also feeds on bark, roots, flowers, and fruit, as well as small invertebrates. Adult males can eat up to 34 kilograms (75 lb) of vegetation a day, while a female can eat as much as 18 kilograms (40 lb). Conservation efforts have led to an increase in the overall population of the mountain gorilla in the Virungas and at Bwindi. The overall population is now believed to be at least 880 individuals. However, despite their recent population growth, the mountain gorilla remains threatened and are listed as Critically Endangered on the IUCN Red List, dependent on conservation efforts to survive. 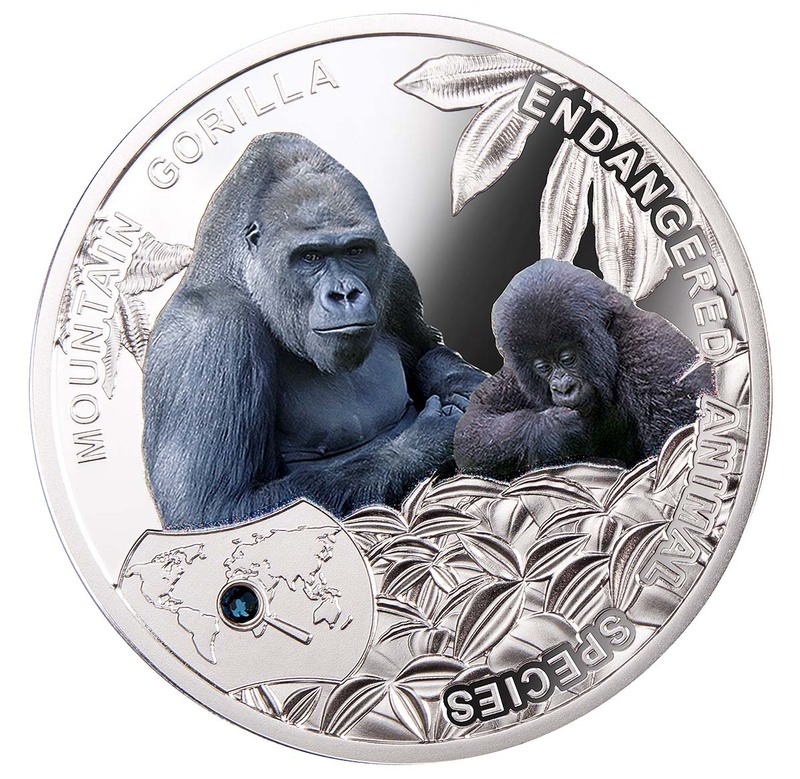 REVERSE: The reverse depicts two digitally printed images of an adult Mountain gorilla and her young, surrounded by leaves of tropical plants. Below, on the left – an image of a map, showing the location of occurrence of the gorilla. 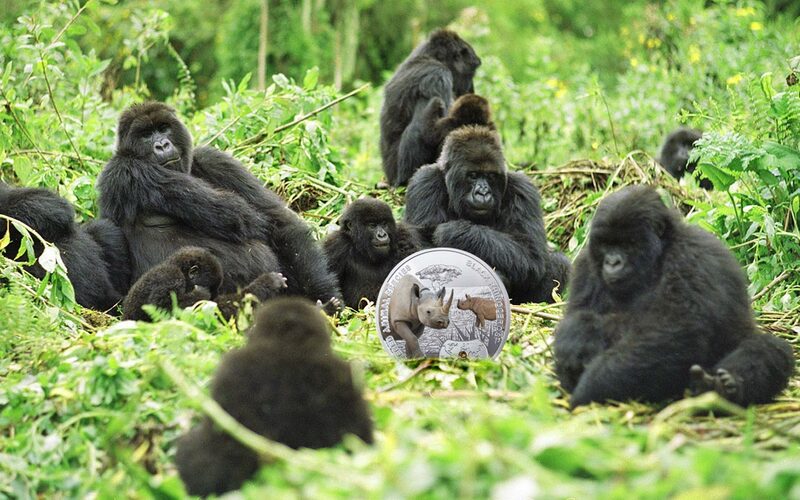 Along the rim – inscriptions: ENDANGERED ANIMAL SPECIES (the name of the series), MOUNTAIN GORILLA (the name of the coin). Ruffed lemur (Varecia rubra) – the largest lemur of the Lemuridae family. The Ruffed lemurs inhabit rain forests in the Eastern regions of Madagascar. They live in small groups consisting of 3 to 5 representatives. This arboreal species leads a diurnal lifestyle. The species is on the list of endangered animal species threatened with extinction. In the natural environment it occurs in just few separate populations. The main threat for the Lemurs’ population is meat hunting as well as business based on selling them as small pets. 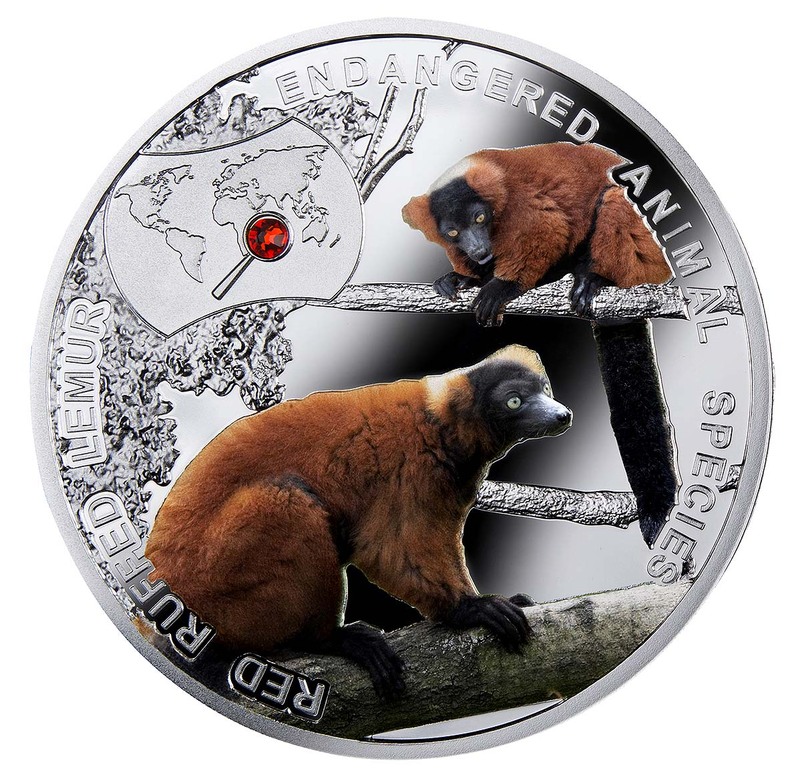 REVERSE: The reverse of the coin shows images of two digitally printed red ruffed lemurs. In the upper part of the coin – an image of a map, showing the location of occurrence of the lemur. Against a map – a magnifier embedded with a SWAROVSKI ELEMENTS crystal, which imitates lens. 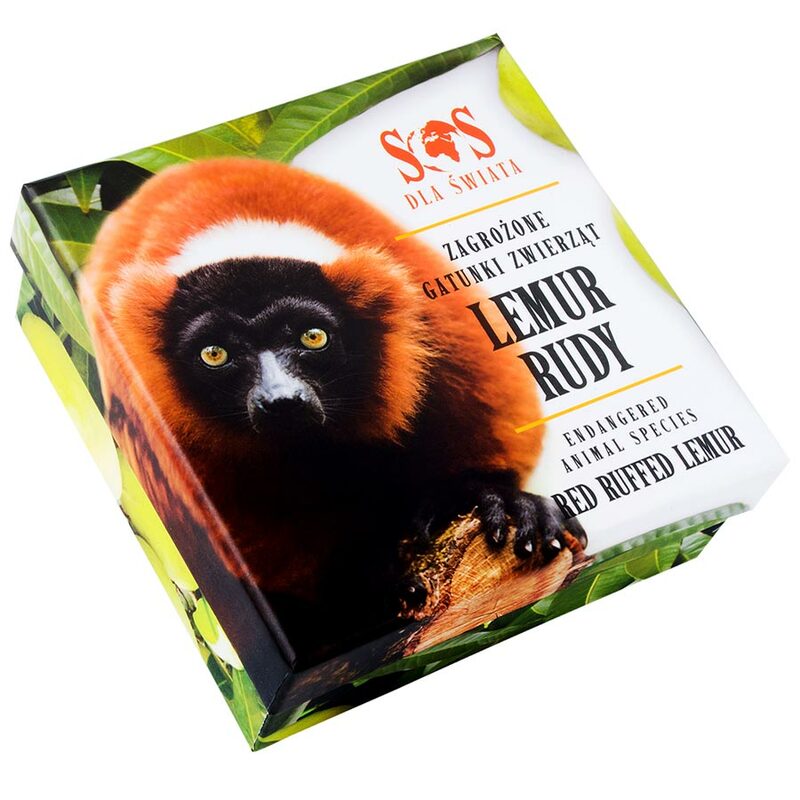 Along the rim – inscriptions: ENDANGERED ANIMAL SPECIES (the name of the series), RED RUFFED LEMUR (the name of the coin). 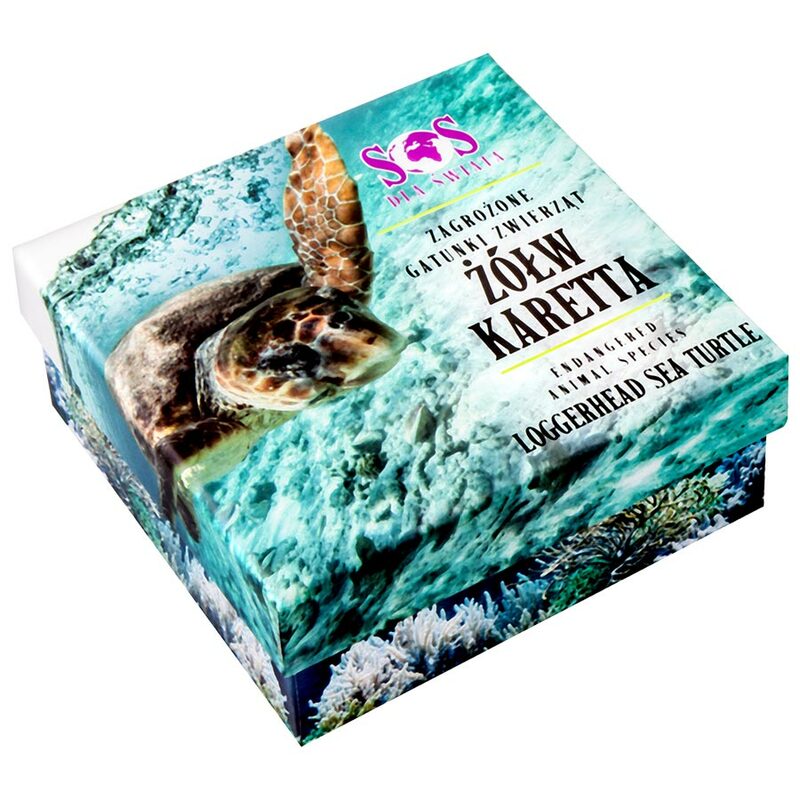 Loggerhead Sea Turtle (Caretta caretta) – is a marine reptile, specifically an oceanic turtle that can measure up to 280cm (110″) in size, although they generally grow to around 90cm (35″) long when matured. While usually weighing up to 135kg (300lb), large specimens have come in at more than 450kg (1,000lb). Found in the Atlantic, Pacific and Indian Oceans, as well as the Mediterranean Sea, the loggerhead spends almost its entire life at sea with the female coming ashore only to lay her eggs. They have a lifespan of 47-67 years, but don’t reach sexual maturity until 17 years old, thus making it difficult for them to replenish when numbers are low. As usual, mankind is the predominant threat, through fishing, the dumping of plastic at sea, and by introduced non-native species raiding nesting sites. 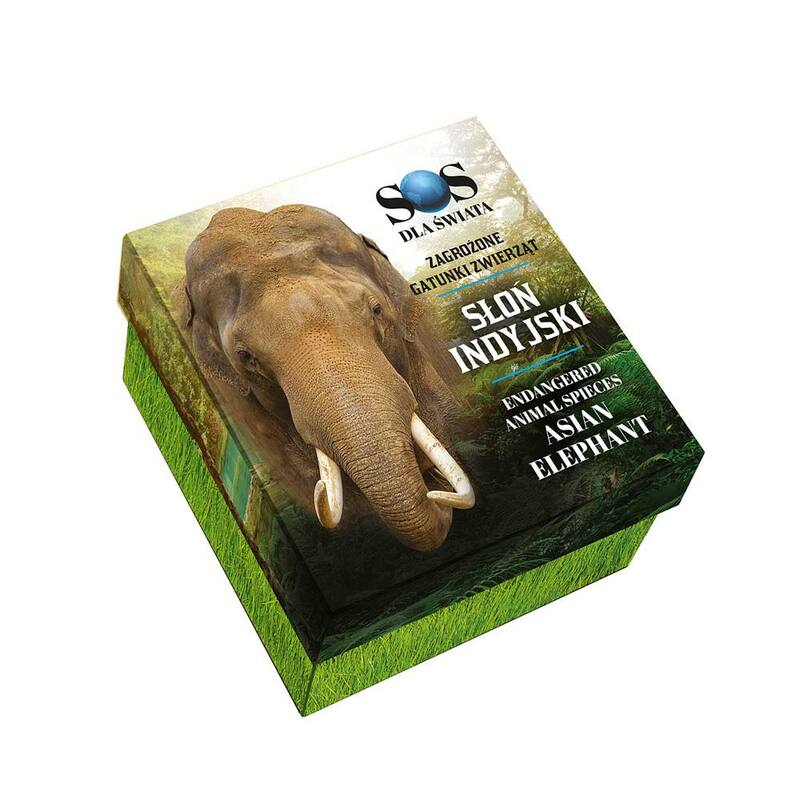 Efforts are underway to help the animal, but it remains classified as Endangered on the IUCN Red List. 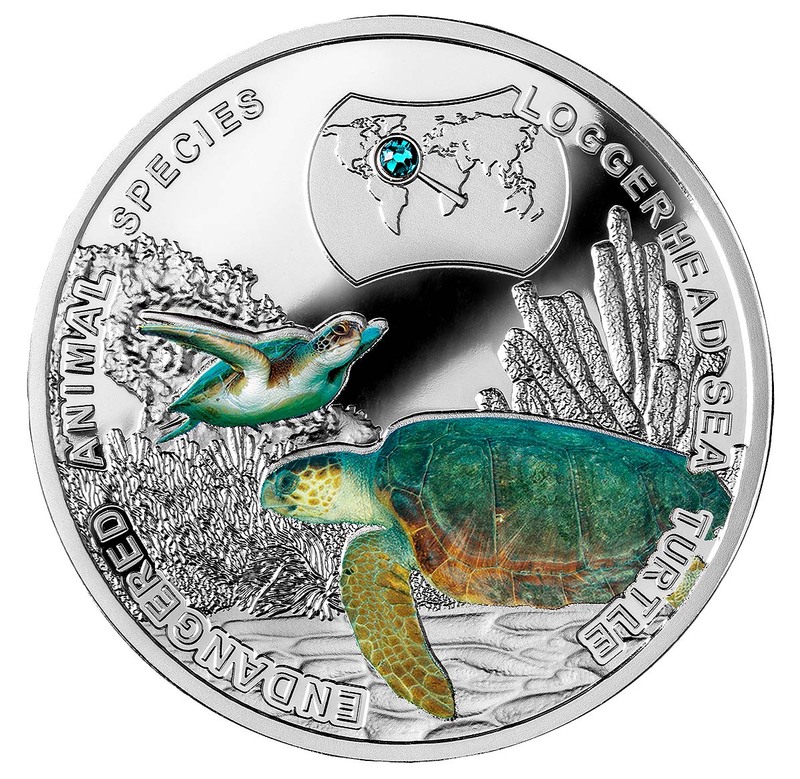 REVERSE: The reverse of the coin shows images of two digitally printed loggerhead sea turtles. In the upper part of the coin – an image of a map, showing the location of occurrence of the turtle. Against a map – a magnifier embedded with a SWAROVSKI ELEMENTS crystal in blue-green, which imitates the lens. 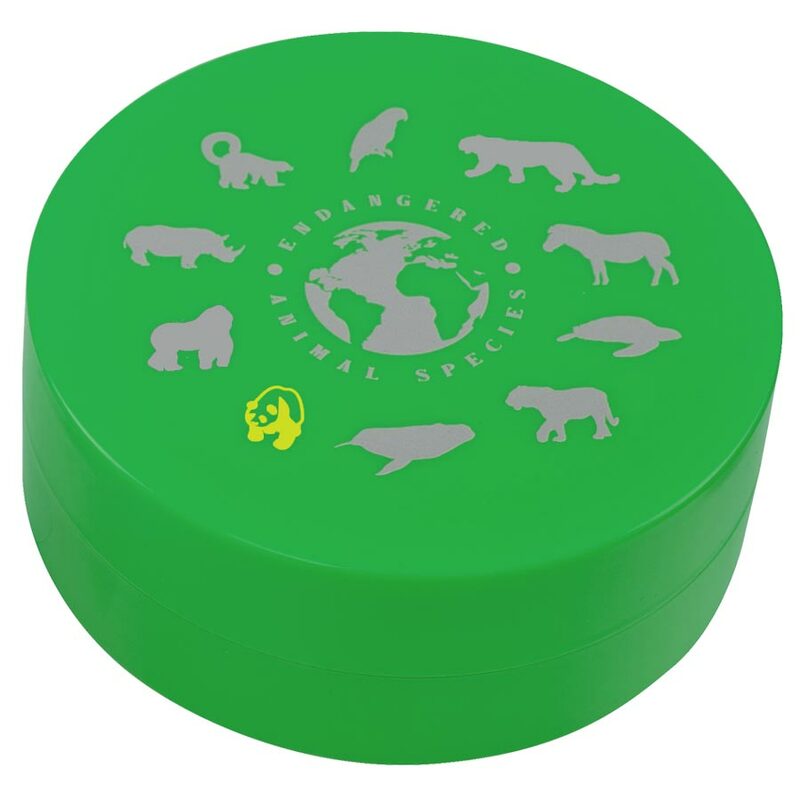 Along the rim – inscriptions: ENDANGERED ANIMAL SPECIES (the name of the series), LOGGERHEAD SEA TURTLE (the name of the coin). 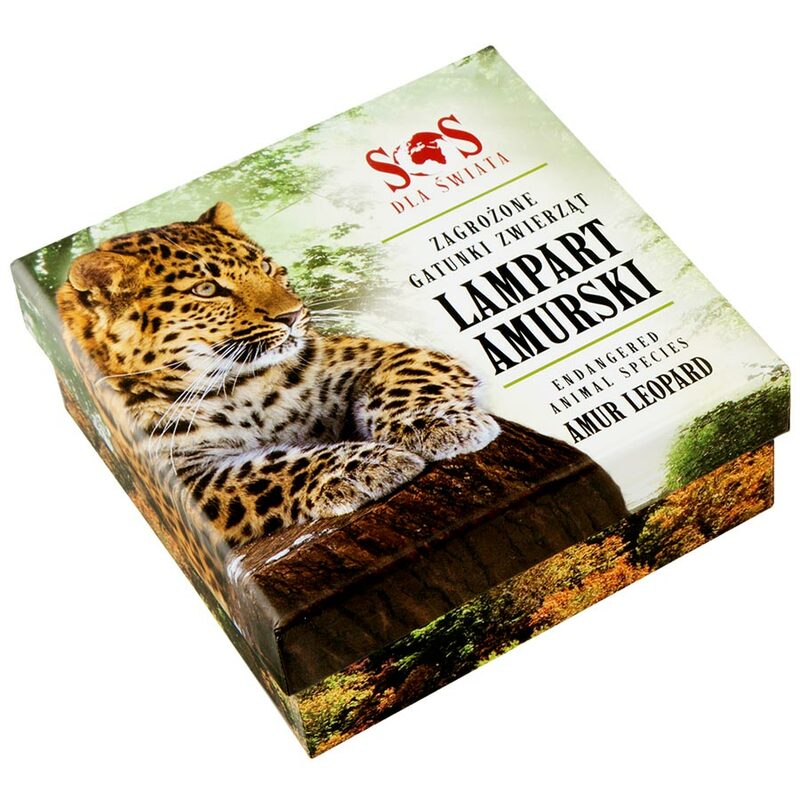 The Amur leopard (Panthera pardus orientalis) is a leopard subspecies native to the Primorye region of southeastern Russia and Jilin Province of northeast China. Smaller than most other leopard subspecies, males generally range from 107-136cm (42-54″) in length, with a tail of 82-90cm (32-35″) and a shoulder height of 64-78cm (25-31″). 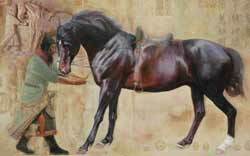 They can weight from 32-48kg (71-106 lb), with females being smaller overall. The only leopard subspecies adapted to the cold, an individual animal can have a range of up to 30,000 hectares (116² miles). It goes without saying that in this area of the world, these absolutely magnificent creatures are almost extinct. 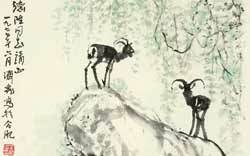 Hunted for parts for backward Chinese ‘medical practitioners’, and with forest degredation brought on by human induced fires, it is estimated that less than 45 animals are left in the wild. That brings with it issues of a lack of genetic diversity caused by inbreeding. It really is disgusting how the people in these regions are free to decimate one of the most diverse ecologies in the world for short-term profit, and through ignorance. 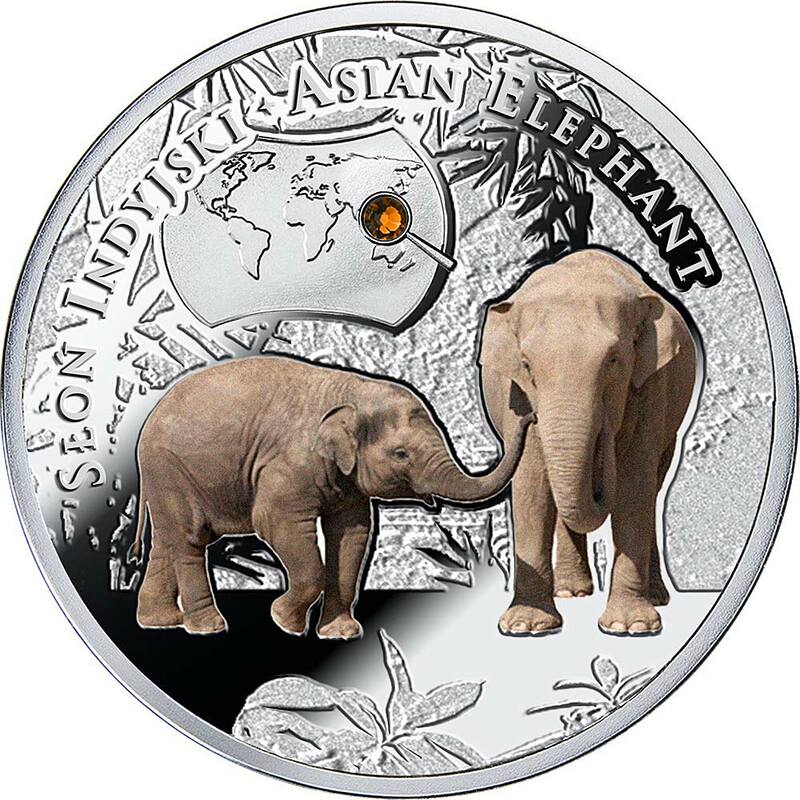 REVERSE: The reverse of the coin shows images of two digitally printed Amur leopards, an adult and a cub. 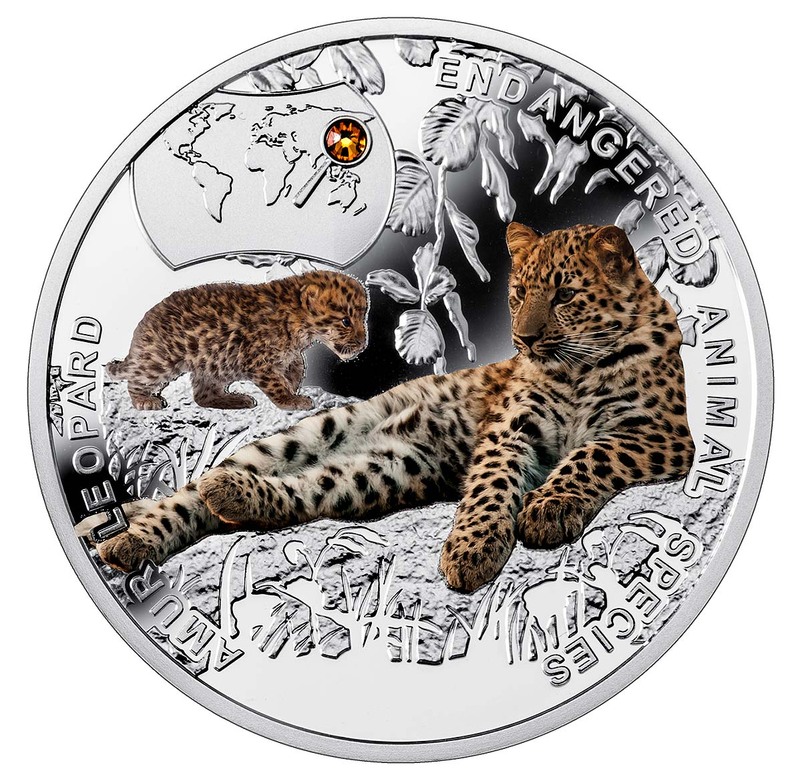 In the upper part of the coin – an image of a map, showing the location of occurrence of the leopard. Against a map – a magnifier embedded with a SWAROVSKI ELEMENTS crystal in orange, which imitates the lens. 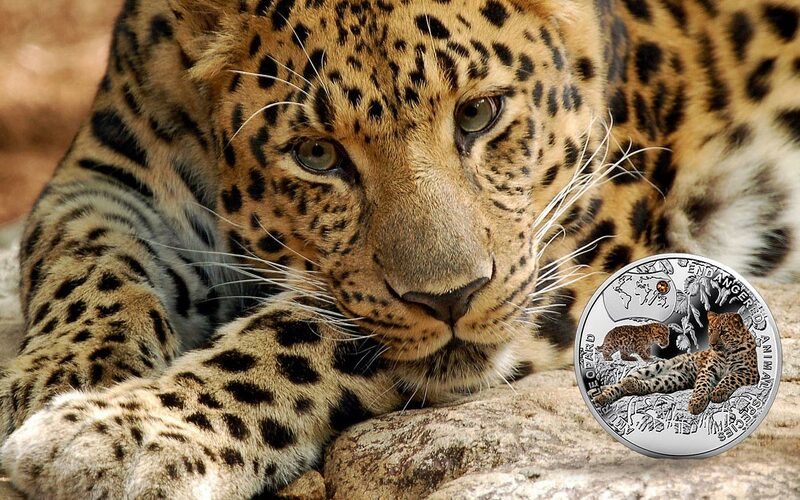 Along the rim – inscriptions: ENDANGERED ANIMAL SPECIES (the name of the series), AMUR LEOPARD (the name of the coin). The blue whale (Balaenoptera musculus) is a marine mammal belonging to the baleen whales. At 30 metres (98 ft) in length and 190 tonnes or more in weight, it is the largest existing animal and the heaviest that has ever existed, weighing over double that of the largest discovered dinosaur. It’s almost certain that Blue Whales in the time before hunting reached even greater sizes. Long and slender, the blue whale’s body can be various shades of bluish-grey dorsally and somewhat lighter underneath. Blue whales feed almost exclusively on krill, though they also take small numbers of copepods. An adult blue whale can eat up to 40 million krill in a day. The whales always feed in the areas with the highest concentration of krill, sometimes eating up to 3,600 kilograms (7,900 lb) of krill in a single day. The daily energy requirement of an adult blue whale is in the region of 1.5 million kilocalories. The whale feeds by lunging forward at groups of krill, taking the animals and a large quantity of water into its mouth. The water is then squeezed out through the baleen plates by pressure from the ventral pouch and tongue. Once the mouth is clear of water, the remaining krill, unable to pass through the plates, are swallowed. 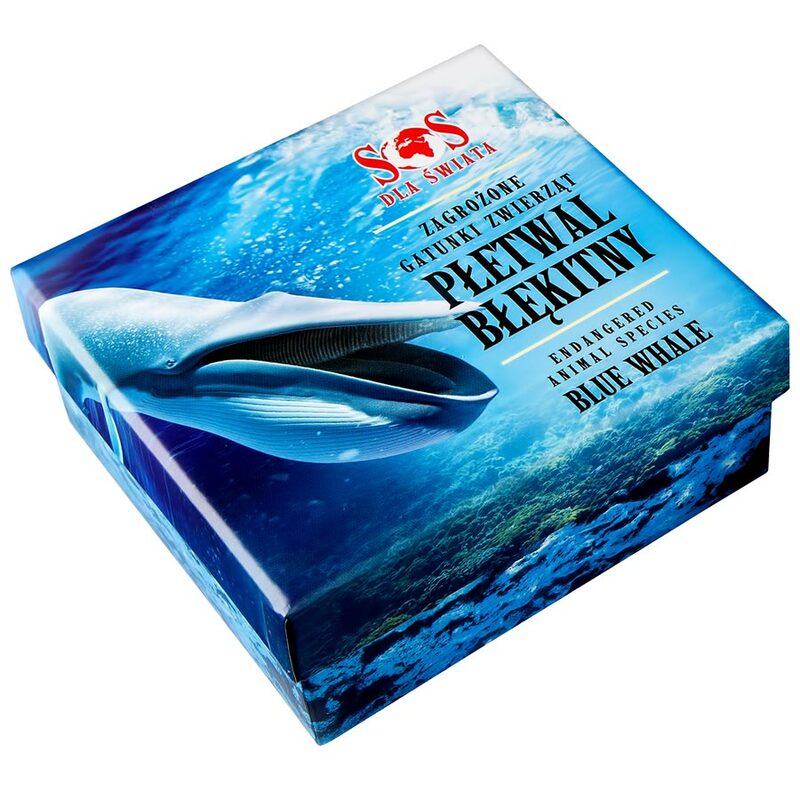 The blue whale also incidentally consumes small fish, crustaceans and squid caught up with krill. Blue whales were abundant in nearly all the oceans on Earth until the beginning of the twentieth century. For over a century, they were hunted almost to extinction by whalers until protected by the international community in 1966. A 2002 report estimated there were 5,000 to 12,000 blue whales worldwide, located in at least five groups. More recent research into the Pygmy subspecies suggests this may be an underestimate. Before whaling, the largest population was in the Antarctic, numbering approximately 239,000 (range 202,000 to 311,000). There remain only much smaller (around 2,000) concentrations in each of the eastern North Pacific, Antarctic, and Indian Ocean groups. 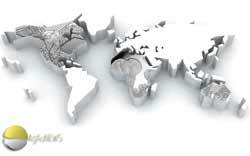 There are two more groups in the North Atlantic, and at least two in the Southern Hemisphere. As of 2014, the Californian blue whale population has rebounded to nearly its pre-hunting population. 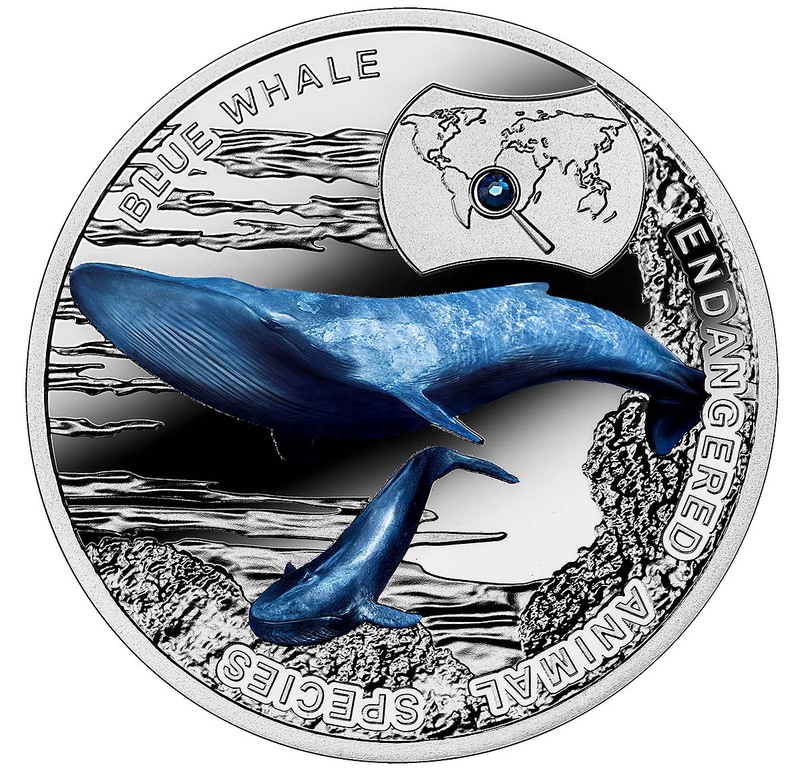 REVERSE: The reverse of the coin shows images of two digitally printed Blue Whales, an adult and a calf. In the upper part of the coin – an image of a map, showing the location of occurrence of the whale. 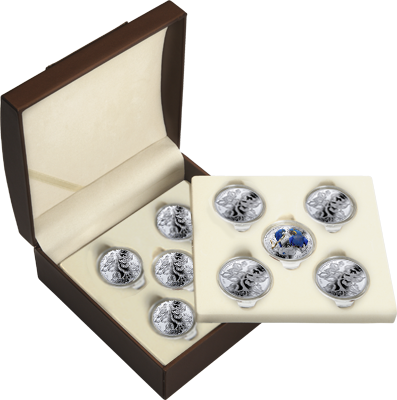 Against a map – a magnifier embedded with a SWAROVSKI ELEMENTS crystal in blue, which imitates the lens. 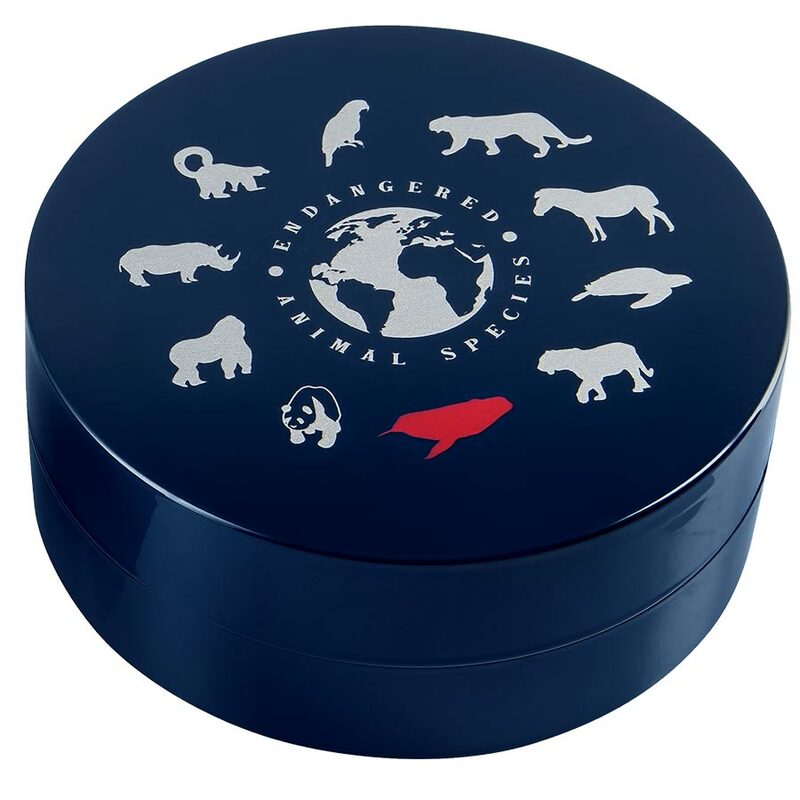 Along the rim – inscriptions: ENDANGERED ANIMAL SPECIES (the name of the series), BLUE WHALE (the name of the coin). In the centre a tree with images representing animals, which are themes of the coins of the series. Above, a miniature profile picture of Her Majesty Queen Elizabeth II and the mint mark (m/w). Along the rim, inscriptions: ELIZABETH II, NIUE ISLAND (the issuer), 1 DOLLAR (the face value), 2014 (the year of issue), Ag 999 (the hallmark). In the central part of the coin – effigy of Her Majesty Queen Elizabeth II. Below – inscriptions: Ag 999 (hallmark) and m/w (the mint mark). 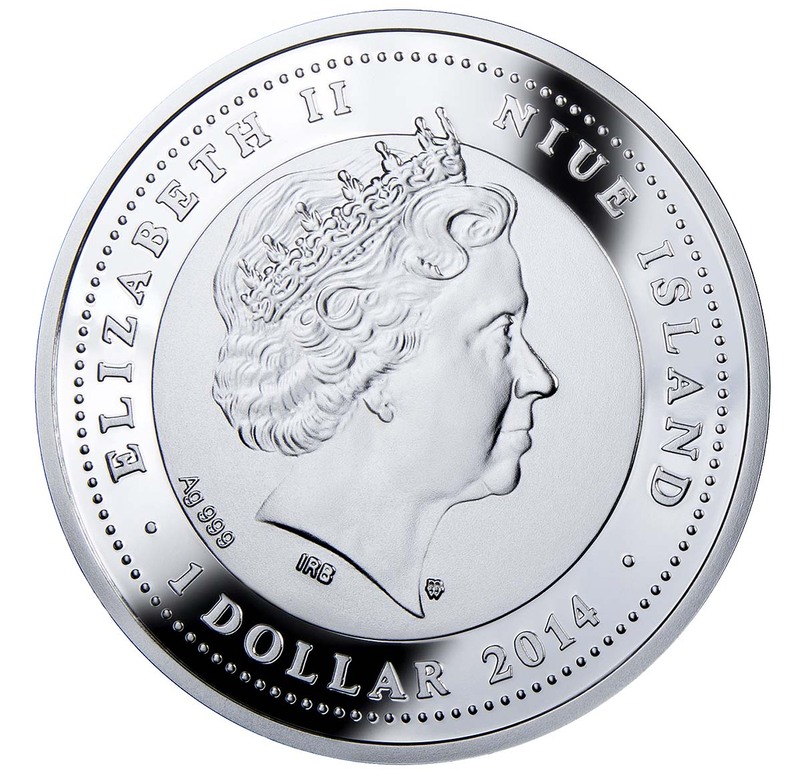 Along the rim are the inscriptions: ELIZABETH II, NIUE ISLAND (issuer), 1 DOLLAR (face value), 2015 (year of issue). Looks like a nice box, but we’ve only seen it in one place and now it’s gone from there. Will certainly make a nice place to consolidate the set given the size of the original packaging, but why it’s so hard to buy is a bit of a mystery. 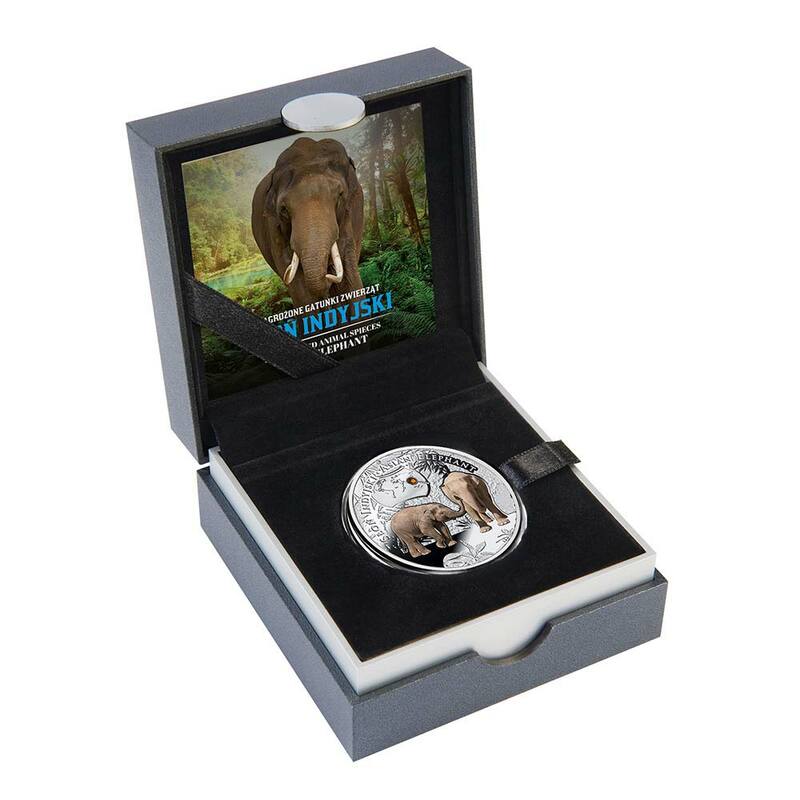 Despite initial indications that this would be a self-contained set issued over a year, the mint has continued to release the ocassional coin to keep the series alive. At the time of writing there have been two issues, the Asian Elephant and the Pygmy Hippopotamus. Whether they continue to add coins to the series through 2017 we’ve yet to confirm, but if the series is popular enough to warrant twelve releases in such a short space of time, we’d assume the odds are good. The only real change to the new coins is the dumping of the cylindrical packaging for the mints more usual rectangular boxes. It’s actually a good change in our book as these boxes are of a decent quality, although they’re not themed like the originals. 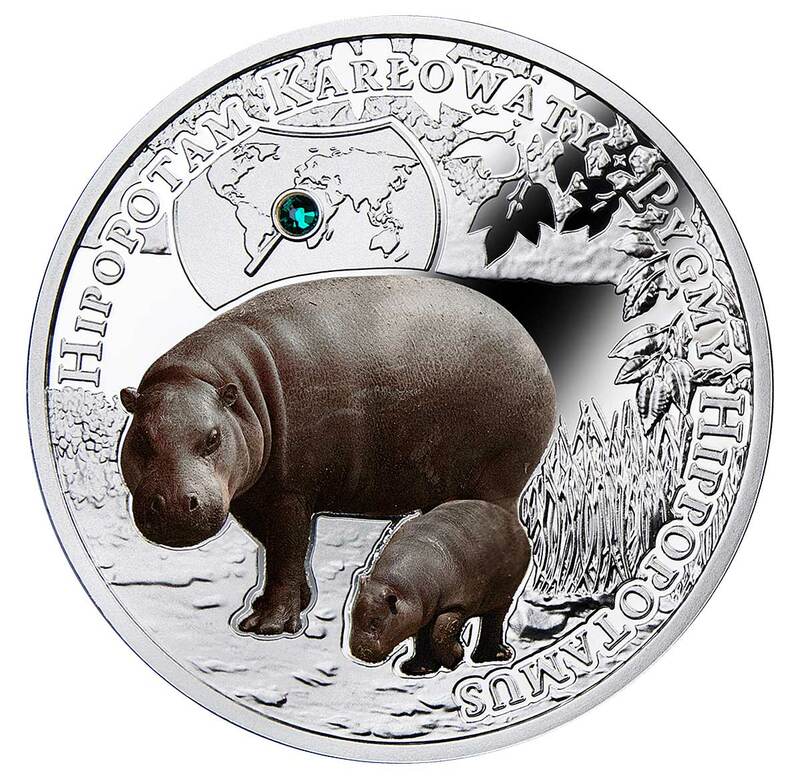 Mintage of the Asian Elephant coin was set at 2015, but the Pygmy Hippo is back down at just 999, perhaps the new level.